Robin Guarino is a theatre opera and film director based in New York City and Cincinnati. 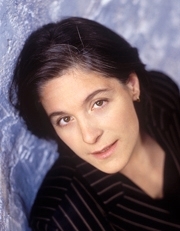 Guarino has directed over 90 original productions and her work has been presented by opera companies, festivals, theaters and symphonies including the BAM Next Wave Festival, Canadian Opera Company, The Cincinnati Opera Avery Fisher and Alice Tully Hall, Seattle Opera, San Francisco Opera, HGOco, the Canadian Opera Company, The Glimmerglass Festival, The Bard Summer Festival, The Opera Theatre of St. Louis and Virginia Opera among others. Guarino's films have been shown at international film festivals throughout the US and Europe and her film, Crossing the Atlantik, was broadcast on Independent Focus POV. Guarino is deeply committed to developing and directing new work. To date she has directed six world premiere opera productions and three films. As Co-Artistic Director of Opera Fusion: New Work she has produced over nine workshops of new operas, most of which have gone on to world premiers at major opera houses in the US including The Metropolitan Opera, Dallas Opera, Minnesota Opera, HGOco, Cincinnati Opera, and Opera Theater of St. Louis. Guarino has collaborated with many top artists in multiple mediums including, Robert Wilson, Christopher Knowles, Hermine Huntgeburth, Rufus Wainwright, Yvonne Rainer, Ricky Ian Gordon, Jake Heggie, Mark Adamo, Barbara Sukowa, Robert Ward, Ned Rorem, Carlisle Floyd, Karita Mattila, Claire Bloom, Renee Fleming, Alice Coote, Susan Graham, Sheri Greenawald, Bryn Terfel, Simon Keenlyside, Ben Heppner, James Morris and Thomas Hampson. She has collaborated with the following Conductors, James Levine, Edo De Waart, Sir Charles Mackerras, Patrick Summers, Leon Botstein, Michael Christie, William Christie, Gary Wedow among many others. Renowned as a teacher and leader in young artist training she has taught at the Juilliard School as Dramatic Advisor to the Juilliard Opera Theater and has held The J. Ralph Corbett Distinguished Chair of Opera at The Cincinnati College-Conservatory since 2007. She has been a master teacher/artist in residence at the San Francisco Opera Center and the Merola Program in addition to Wolf Trap Opera, The Glimmerglass Festival and other prestigious young artist training programs including, The Lindemann Program, The Houston Grand Opera Young Artists program and is in constant demand as a teaching artist. Lincoln Center has long been an artistic home to Guarino. She became a member of the Metropolitan Opera Stage Directing Staff in 1992 and has been invited back to direct over a dozen productions including Così fan tutte and Der Rosenkavalier for Live in HD. She has directed the Mozart/Da Ponte trilogy. Prior to her tenure at the Metropolitan opera she was a directing Intern at the Munich State Opera. Guarino received her MFA at Bard College. She speaks Italian, German and French. She has been the recipient of grants from the New York State Council on the Arts, New York Foundation for the Arts, The Jerome Foundation, The Robert Rauschenberg Foundation, The Andy Warhol Foundation, Art Matters Inc.The Hamburg Filmhaus Gmbh and in her capacity as chair of Opera at CCM: The Andrew W. Mellon Foundation, The Kurt Weil Foundation, The Britten Pears Foundation and The Harmony Fund. BA and MFA, Bard College, Annandale-on-Hudson, NY. (Additional studies at The British Institute and Goethe Institute; study with Jean Pierre-Ponnelle at the Munich State Opera and The Metropolitan Opera).